Staff from Thornhill Primary School, winners of the Best Contribution to a Heritage Project by Young People for their Armistice Cantata. © Lauren Vickerman Poppet Studios Photography. The children of Thornhill Primary School visited Glamorgan Archives to research the Great War. They found a war recruitment poster, appeals for women to take up factory work, and a black-edged telegram telling a mother that her son would not be coming home. 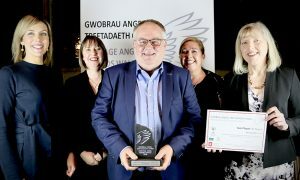 These inspired them to write lyrics to seven popular tunes from the First World War, which they wove into a musical that they have performed to audiences of elderly people all round the Vale of Glamorgan. They have also created a resource for use by other schools, with the music, lyrics, script and background information on the war. 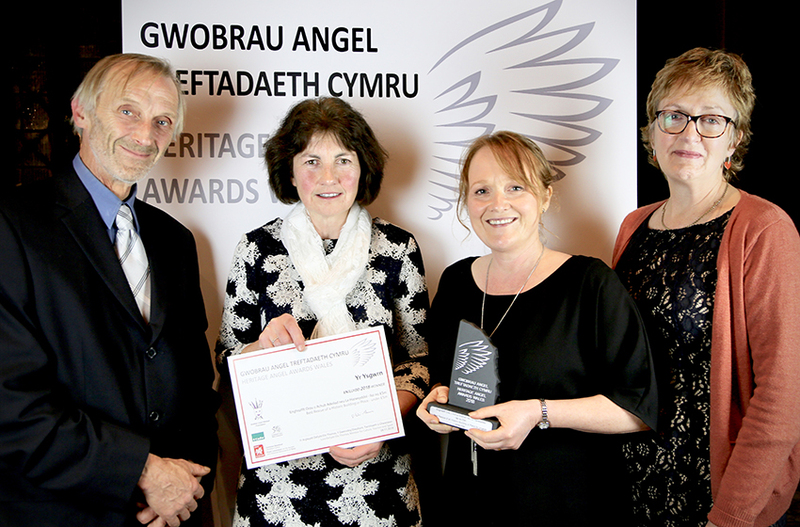 Voices from the Factory Floor project by Women’s Archive Wales won the Best Heritage Research, Interpretation or Recording Project award. © Lauren Vickerman Poppet Studios Photography. Women’s Archive Wales was founded to raise the profile and safeguard the sources of women’s history in Wales. 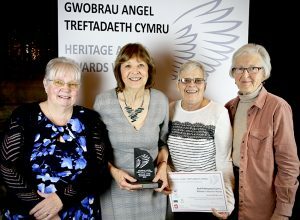 In 2013, trained volunteers mounted roadshows all over Wales to gather the experiences of women now aged 60 to 90 who did factory work between 1945 and 1975, often as the family’s chief breadwinner. 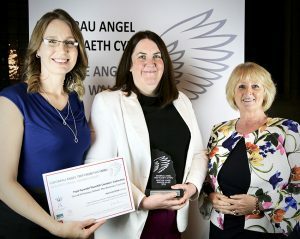 Over 200 interviews were recorded and are now available at the National Sound and Screen Archive in Aberystwyth along with thousands of images available via the People’s Collection Wales website. The results have inspired TV and radio documentaries, a musical (Inge Thomson’s Ffatri Vox) and many creative projects. 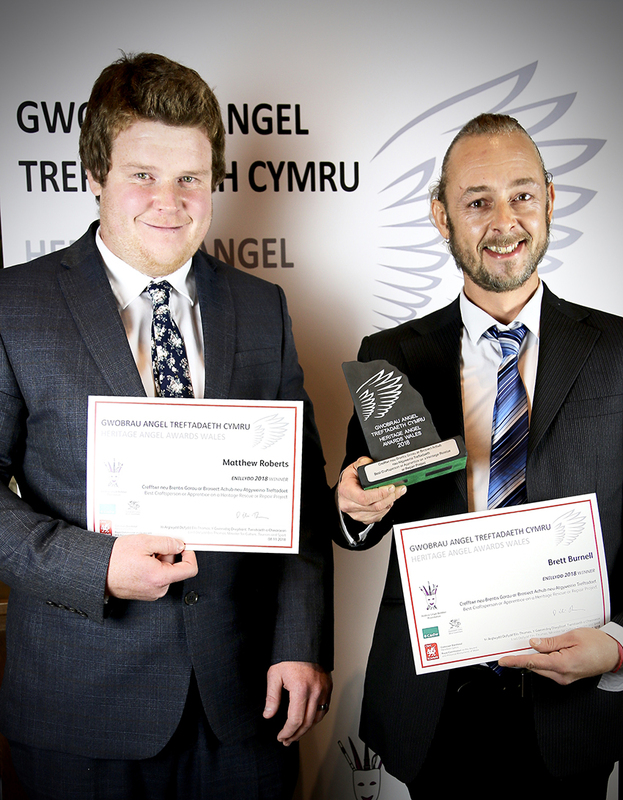 Matthew Roberts and Brett Burnell won the Best Craftsperson or Apprentice award for their work at St Fagans National Museum of History. © Lauren Vickerman Poppet Studios Photography. Using a range of traditional building skills, Matthew Roberts and Brett Burnell were largely responsible for building a reconstruction of the thirteenth-century great hall of Llywelyn ap Iorwerth (Llywelyn the Great), Prince of Gwynedd, based on written records and the excavated remains of his palace complex on Anglesey. The hall they built will host school group sleepovers, while Matt and Brett have now graduated with NVQs in stonemasonry and joined the museum’s permanent team of conservation builders, where their next challenge will be to reconstruct a public house dating from 1853. Yr Ysgwrn, home of Hedd Wyn, won the award for the Best Rescue of a Historic Building under £5 million. © Lauren Vickerman Poppet Studios Photography. 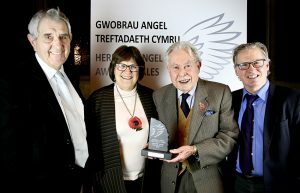 Hedd Wyn, the Welsh farmer-poet, was posthumously awarded the bard’s chair at the 1917 National Eisteddfod having lost his life at the Battle of Passchendaele. Hedd Wyn’s mother vowed ‘to keep the door open’ to the stream of pilgrims calling at the family farm, Yr Ysgwrn, to pay their respects to a person who represented a lost generation. A century on, urgent work was carried out to conserve the grade II*-listed farmhouse while retaining its special atmosphere. The associated farm buildings have been adapted to inform visitors and school groups about Hedd Wyn, the Great War, Welsh culture and agricultural heritage. St Fagans National Museum of History won the Best Rescue of a Historic Building over £5 million. ©Lauren Vickerman Poppet Studios Photography. The grade II-listed main museum building at St Fagans is a rare example of Welsh Modernist heritage, designed by the Percy Thomas Partnership in 1975. The community was involved in planning the transformation of the building to create a spectacular light-filled atrium in place of the former open courtyard while retaining its essential character. The exhibition space – now housing the museum’s rich social history and archaeology collections – has doubled and new workshops provide eight times more space for schools and visitors to participate in a wide range of courses, putting the visitor experience front and centre. Insole Court, the Grade II*-listed neo-Gothic mansion in Llandaff saved by community effort, won the public vote based on all fifteen of the projects shortlisted for an award. © Lauren Vickerman Poppet Studios Photography. Insole Court, a Grade II*-listed mansion with stables and gardens, the former home of one of Cardiff’s great coal-merchant families, saved by community effort and restored by the Insole Court Trust at a cost of £4.5m to provide community facilities with education spaces, a community hall, café, training suite and visitor centre, as well as exhibition spaces telling the story of Insole Court, the history of the Insole family and their role in developing Rhondda steam coal.